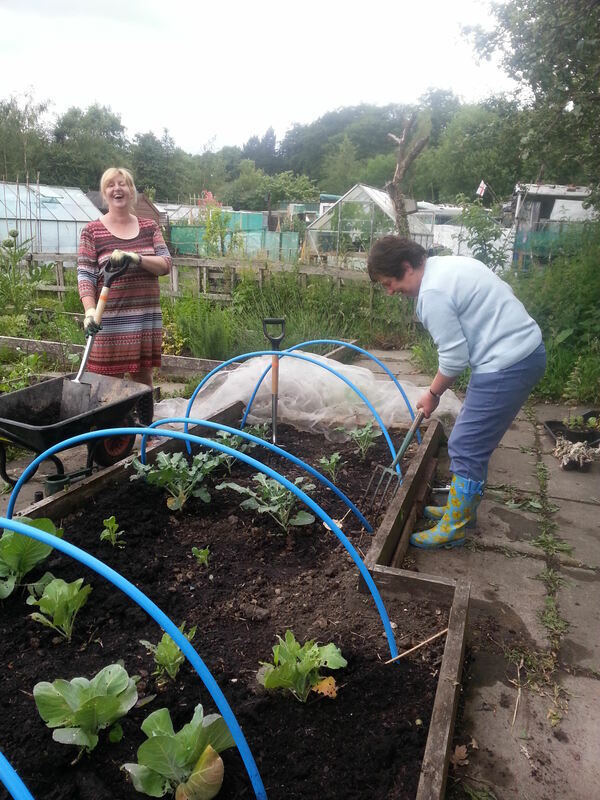 Our community learners were hard at work this week keeping the weeds in check at the Operation Farm plot in Hyde Park Allotments. In our lesson on vegetable plant care, the fourth in a series of community learning sessions for new vegetable gardeners, we looked at weed identification including a weed quiz and then we got to work with some practical weeding, watering and mulching. The sessions aim to provide local people with practical skills and knowledge in vegetable growing, whilst we work together to maintain the community plot. We’ve been lucky enough to receive a donation of fantastic Revive compost which is recycled from green garden and organic waste collected from households in Greater Manchester by Viridor. This was put to good use on the brassica and bean beds, to help feed plants and keep the moisture in should another spell of fine weather be coming our way – fingers crossed for that! Our thanks to Viridor and Recycle for Greater Manchester for the donated compost which will give our veggies an extra helping hand. The last two learning sessions, funded by the Community Learning Fund, are “Looking after your soil” on Tuesday July 15th, and the “Harvesting and planning ahead” on Tuesday July 22nd. If you’re interested in attending one or both, please get in touch by email operationfarm@gmail.com for details. Further maintenance sessions on Tuesday evenings will also take place in July, August and September to keep up with the plot and the community orchard in the adjacent Hyde Park as well. Final dates will be posted here soon. See Revive compost in action on Operation Farm’s allotment.